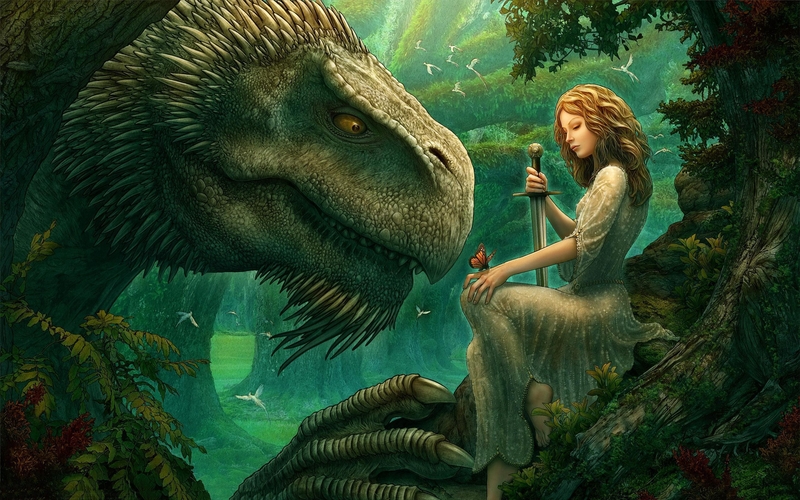 The intriguing relationship between a princess and a dragon. “You know, I’ve never really got Halloween,” he said to himself, trundling down the street. Packs of squealing children ran wild, with worn-out adults trailing after them like old sheepdogs herding baby sheep. Scratching absent-mindedly at one of the patches of dead skin that afflicted his face, half hidden by an unkempt beard, he continued chattering away to himself. If he noticed that most of the adults were steering the kids as far away from him as possible, he did not show it. He jumped, making an odd yelping noise as he did so, when he heard the little voice, wondering for a second if his mind had actually started talking back to him. But it was just a little girl, all dressed up as a little princess. The tiara that was loosely placed on her head wobbled a bit. She tilted her head to the side in her curiosity. The girl shrugged, not offering any possible answer. Noting that she was alone, he looked around for someone who seemed like they had lost something but could not see anything of the sort. Itching his neck, he looked back down at the little girl. “What are you, a princess?” He asked the question to fill the silence, since she did not appear to be in a hurry to leave. She nodded enthusiastically. “Me? I’m a dragon,” he pronounced. The little princess look at him, scepticism etched onto her small face. “You don’t look much like a dragon,” she proclaimed. The girl thought to herself for a moment before answering, tapping her chin with a chubby finger. Suddenly his face lit up and he knelt down to get face to face with his royal companion. “Oh really?” he retorted gently, a crooked smile wrinkling his mouth. He waved at her to get closer and when she did he cupped his hands around his mouth, took a deep breath and puffed it back out. And the little princess ran away screaming like a banshee when a small streak of flame shot from his mouth. Standing back up with a stupefied look on his face, he noticed with surprise that everyone in the street was staring at him. He gave an embarrassed chuckle and raised his hands out in a show of innocence. Blue-Eyed Devil’s piece ‘The Princess and the Dragon’ was submitted as part of Inkblots’ Fiction Frenzy competition. Out of all the entries we received, we felt BED’s piece used the theme in the most interesting way, without it expressing a wad of clichés. His past written works include ‘You’re Home’ and ‘Thankfully Forgetful’. He also writes quite a number of Haiku.